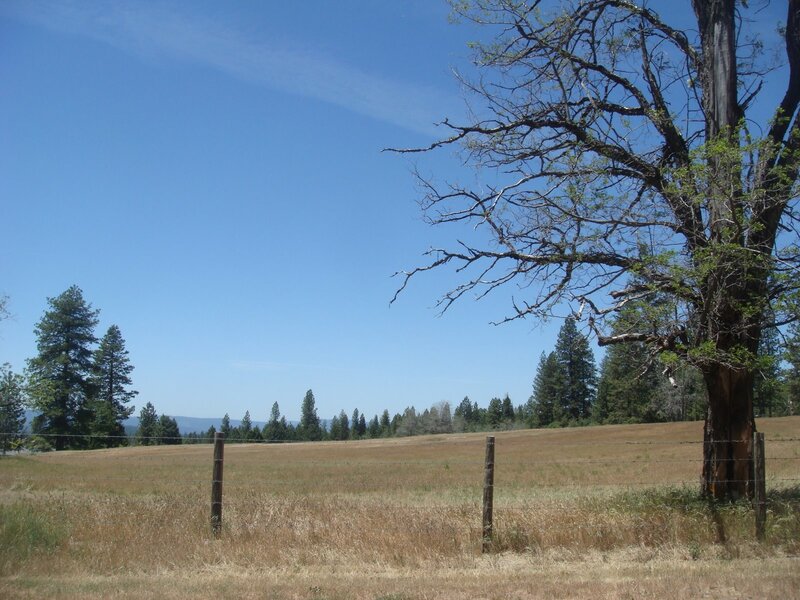 Finding myself in the unusual circumstance of having an idle day, I decided to take a trek down the only trail in Malakoff Diggins State Park that I had not yet completed – Humbug Trail. 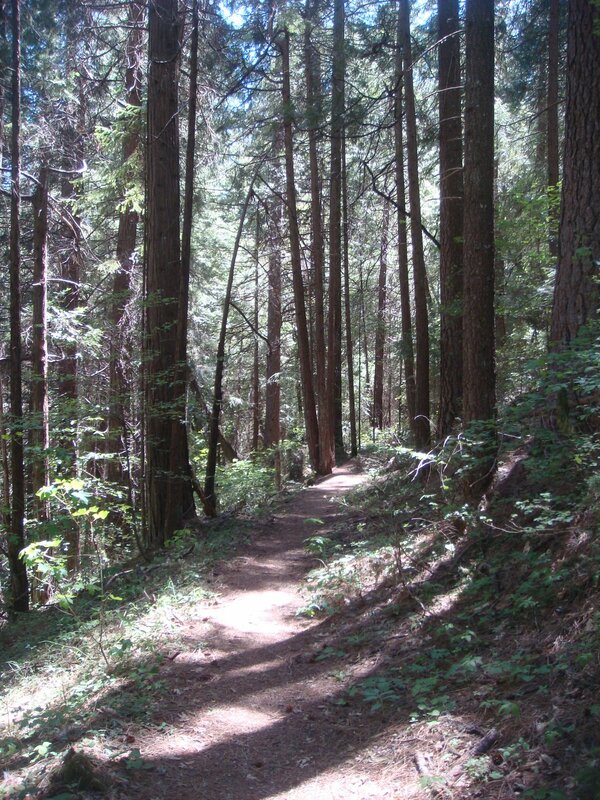 Humbug Trail follows Humbug Creek for 2.5 miles down to the South Yuba River and the South Yuba Trail. 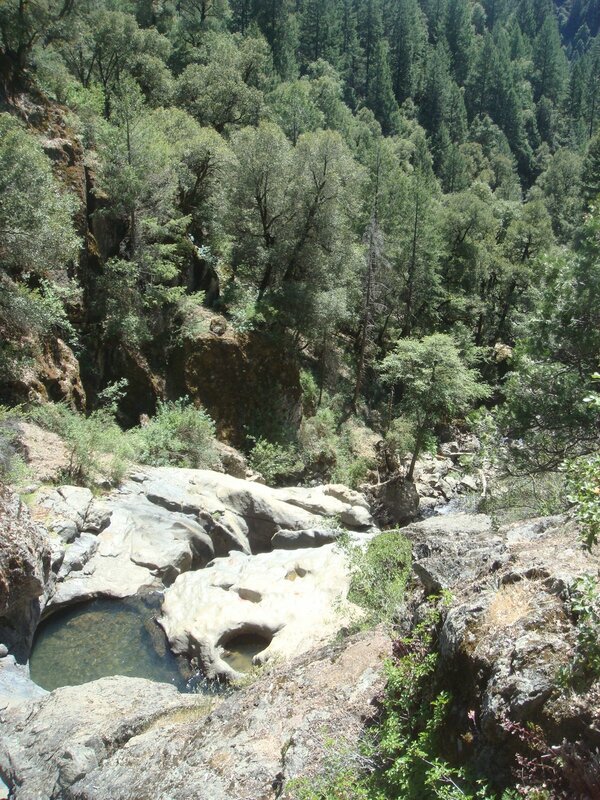 In order to drain the 7000-foot-long, 3000-foot-wide Malakoff pit, the North Bloomfield Mining and Gravel Company constructed a 7874-foot bedrock tunnel that runs into Humbug Creek. Eight shafts, averaging 200 feet in depth, were sunk at intervals to assist construction. Construction that consisted of 500 men working around the clock drilling, blasting, digging and hauling (Hiller Tunnel was a part of this construction process). The tunnel was completed in 1876 at a cost of $275, 574 and remains an impressive engineering feat. As one descends the Humbug Trail, one will pass some of the water-filled shafts that were used to construct the drain tunnel. 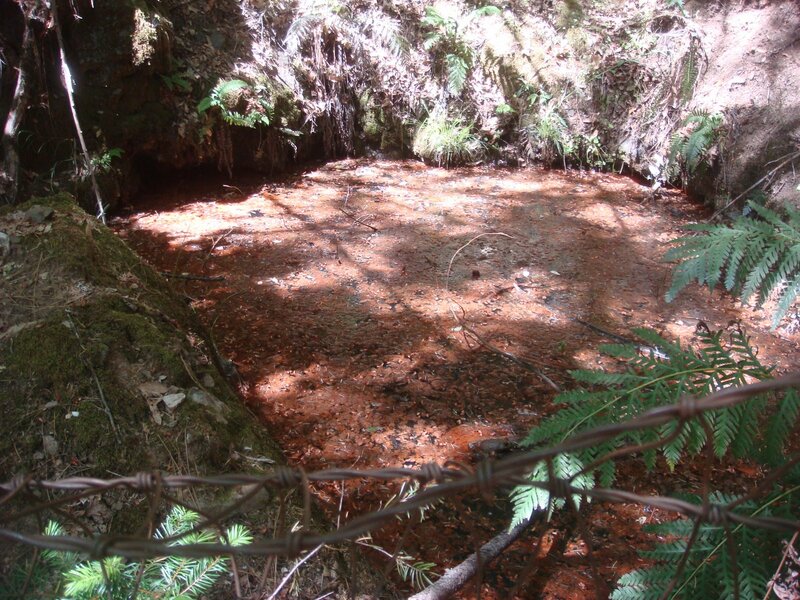 Despite the orange color of the water, there are frogs and plants living in these things. 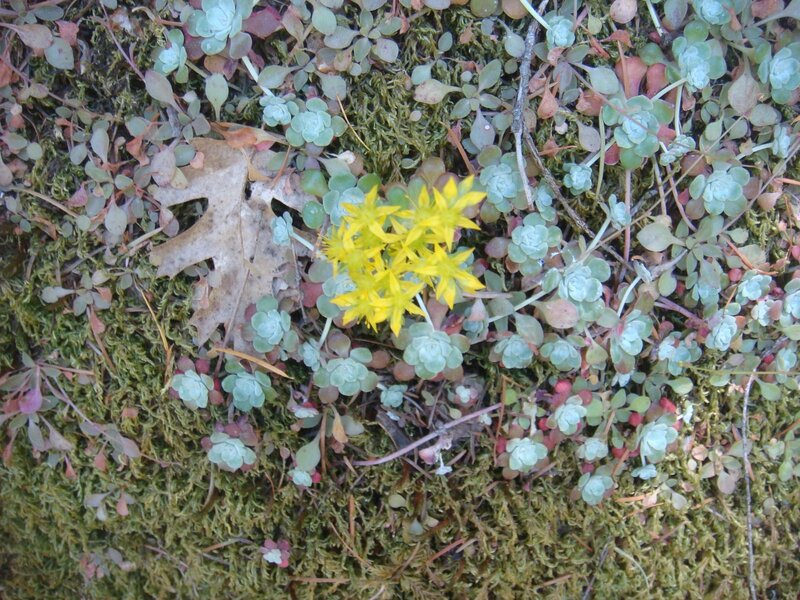 The orange color is the result of high iron content in the bedrock. 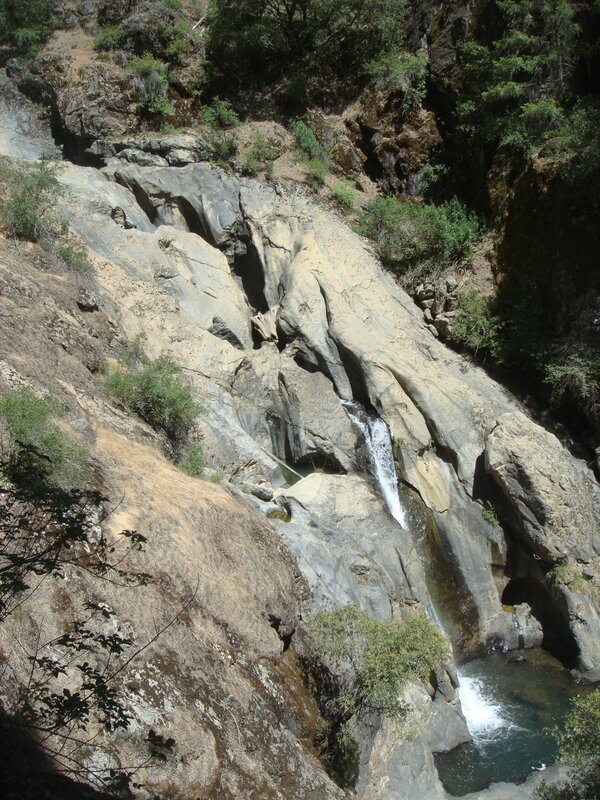 The canyon has made a comeback from the mining days as there are now some relatively large trees and plenty of streamside vegetation now. 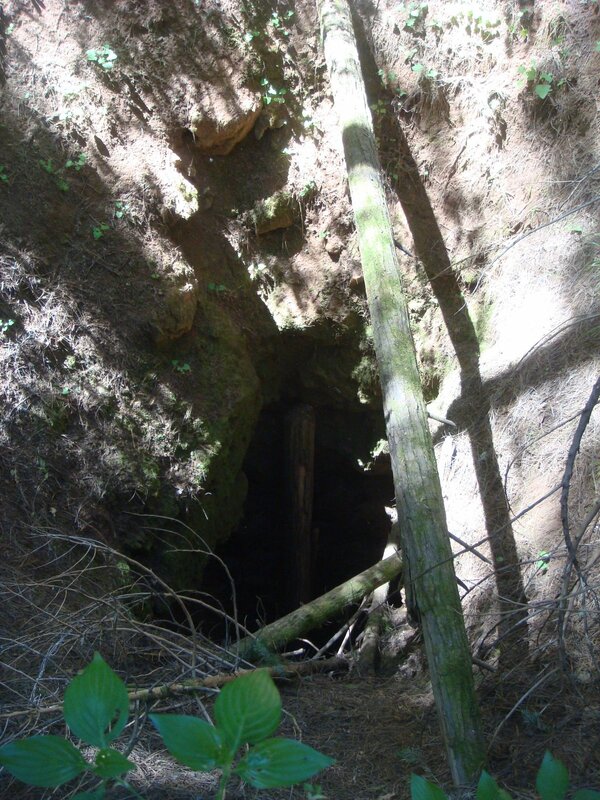 As the trail descends, it passes by abandoned shafts and flats that were former mining camps. This is how one knows where the interesting sites are. I use these as a beacon. 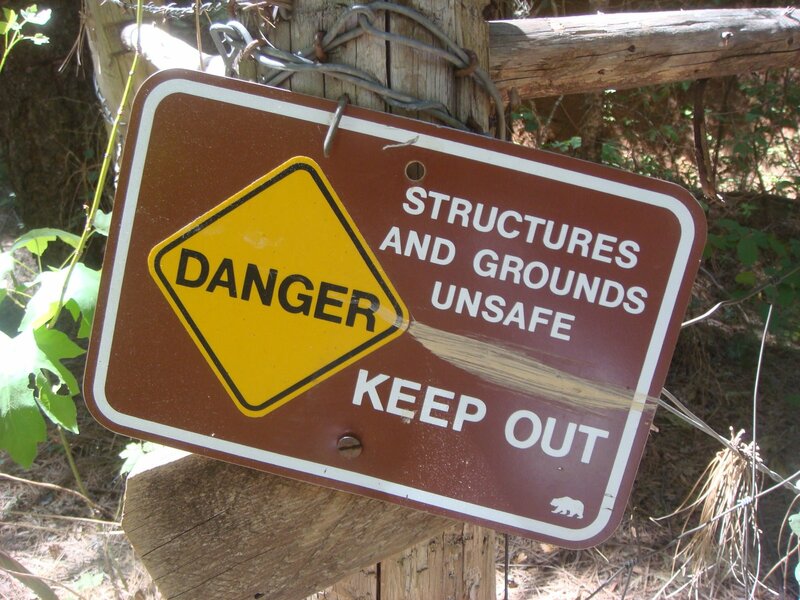 The sign pictured above was to keep people away from this shaft (one of the eight mentioned above). It’s pretty easy to clamber over the fence intended to keep people out though. Unlike the other shafts, this one is dry and although it is difficult to tell in my picture, it goes straight down for quite a way. 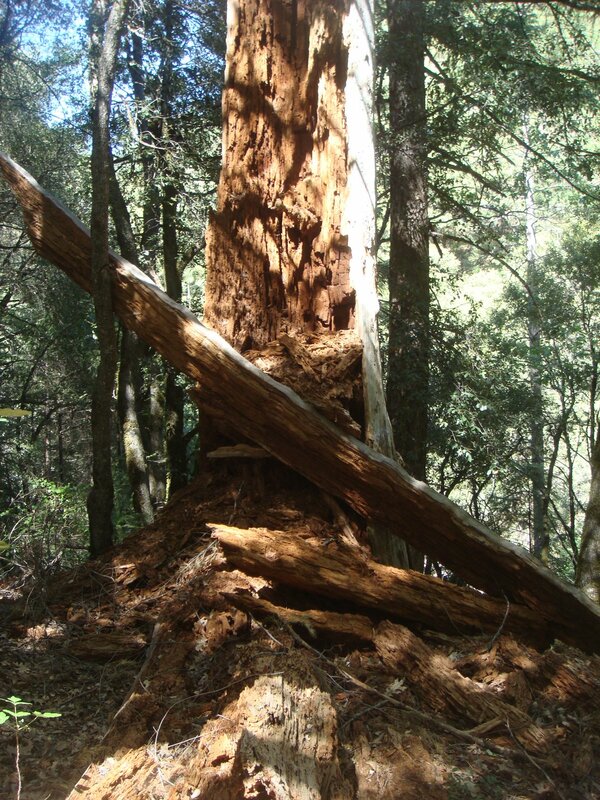 As the trail continues to descend (Yes, I know the trail in the picture below is ascending, but this is a rare exception), there are an increasing number of oaks and a corresponding decrease in the number of conifers. Humbug Falls – at their best in the spring when there is a lot of water moving through. 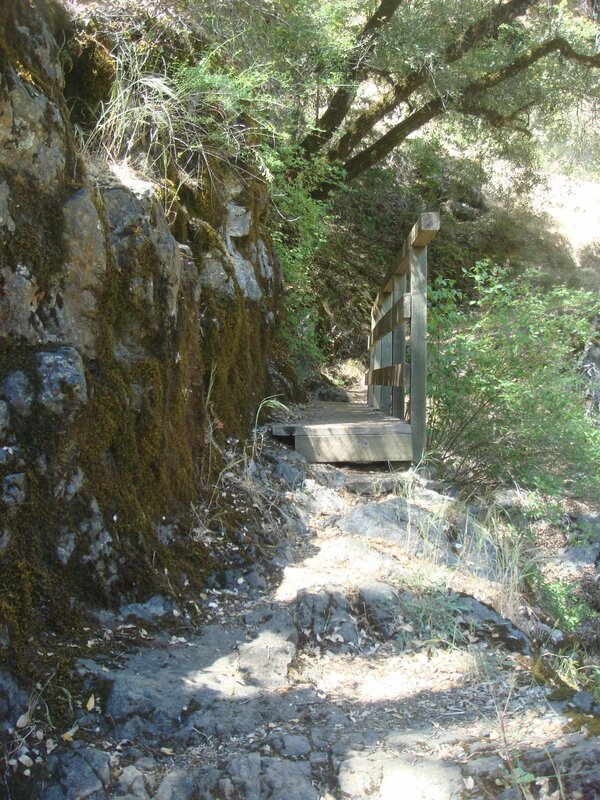 The North Bloomfield drain tunnel empties into Humbug Creek several hundred feet below the falls, but one cannot see the exit of the tunnel from the trail. 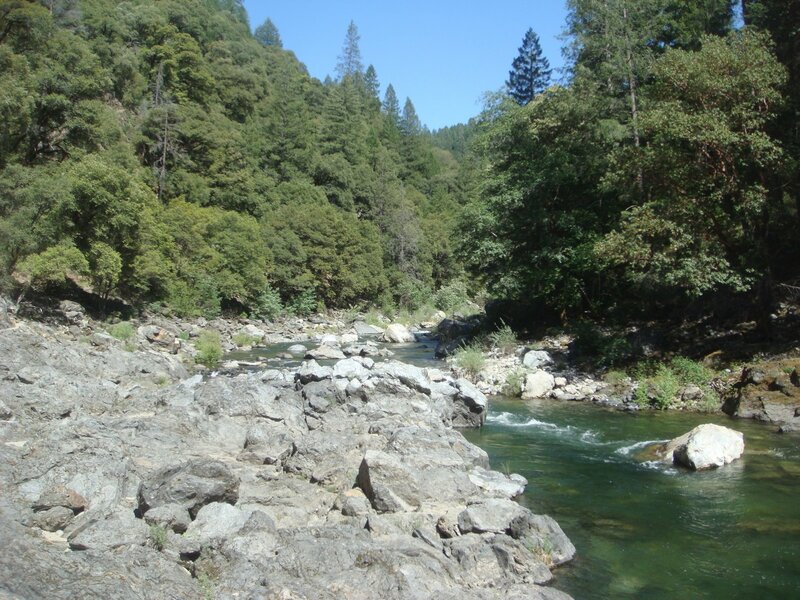 However, there are places where one can see the polished bedrock and boulders in Humbug Creek (and the South Yuba below it) that were created by the torrent of muddy gravel coming from the Malakoff pit. A large garter snake startled the hell out of me here by literally exploding out of a pile of leaves near my feet and racing behind this log. The end of the Humbug Trail. 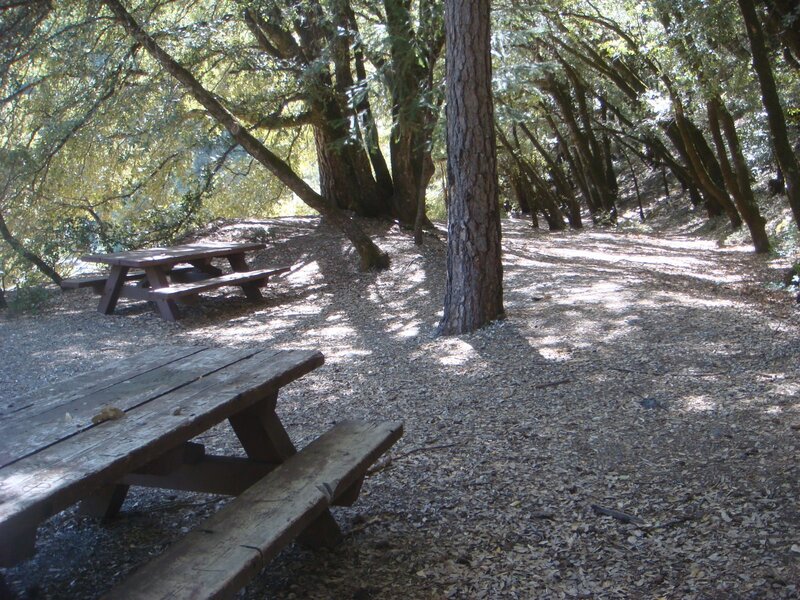 This shaded ledge pictured below overlooks the South Yuba River and is a good place for lunch or just to rest. 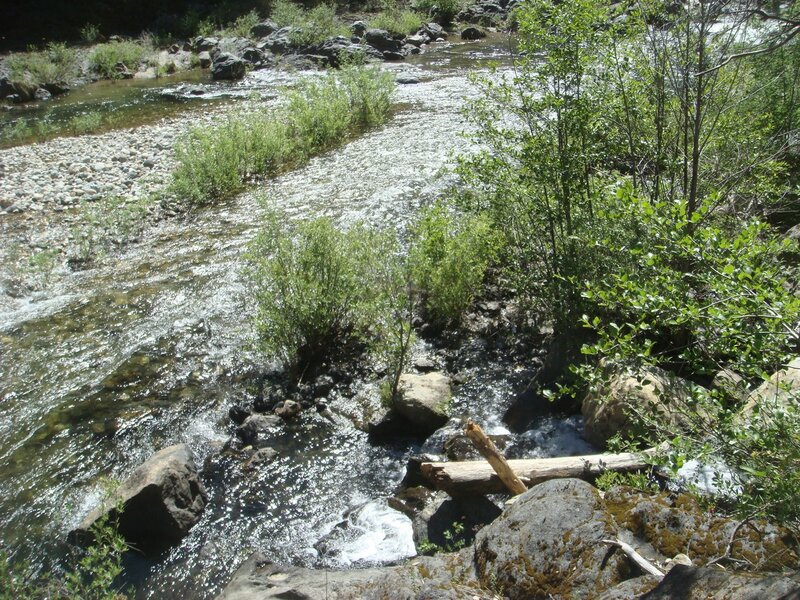 The picture below is the view from the edge of the ledge down to the river. 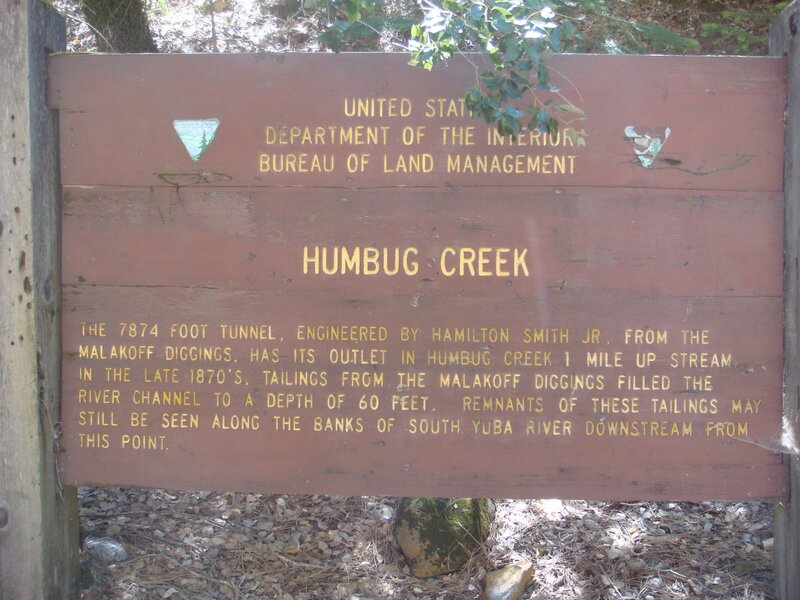 Humbug Creek Sign – this sign greets you at the bottom… It reads: Humbug Creek The 7874 foot tunnel, engineered by Hamilton Smith Jr. from the Malakoff Diggins, has its outlet in Humbug Creek 1 mile upstream. 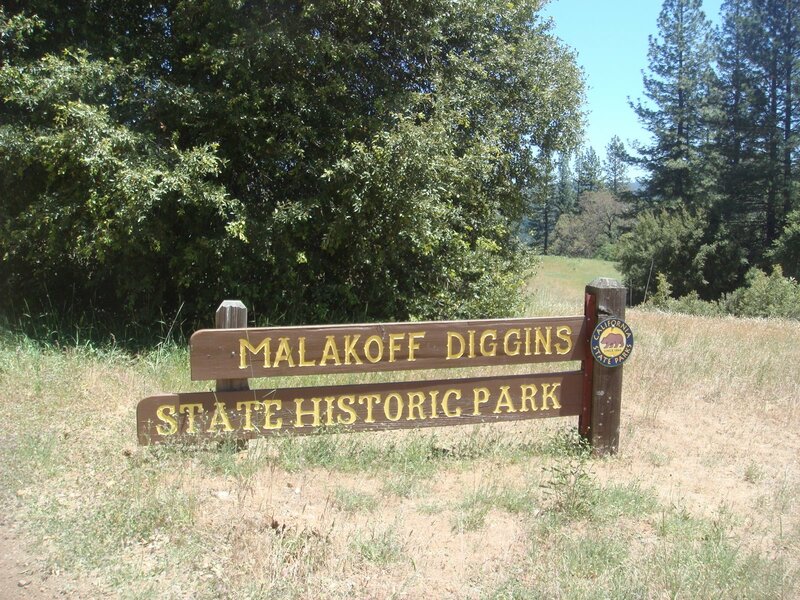 In the late 1870s, tailings from the Malakoff Diggins filled the river channel to a depth of 60 feet. 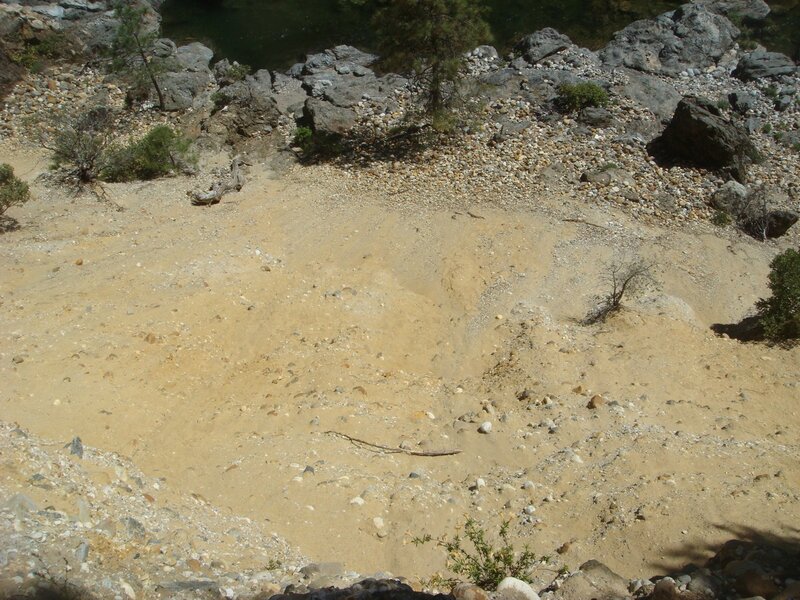 Remnants of these tailings may still be seen along the banks of South Yuba River downstream from this point. And by the way, when I was here there was a swarm of very large black bees swarming around the left edge of the sign. As I have heard other people mention this, I assume the bees may have a nest inside the sign. Although they may look intimidating, the bees were not aggressive and I walked all around them without incident. While they may look placid, the water is really moving early in the year when I was there. Swimming across and back across the deep sections took almost everything I had which surprised me. 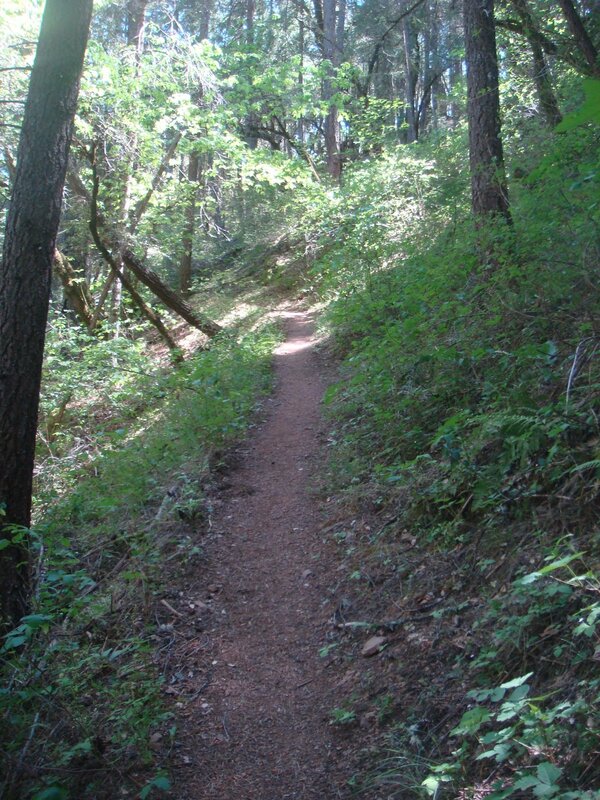 I took some more pictures of Humbug Creek as the light was better on the way back up. There are a lot of cool places to stop along the way without needing to dash to the end of the Humbug Trail for the happy ending (so to speak). 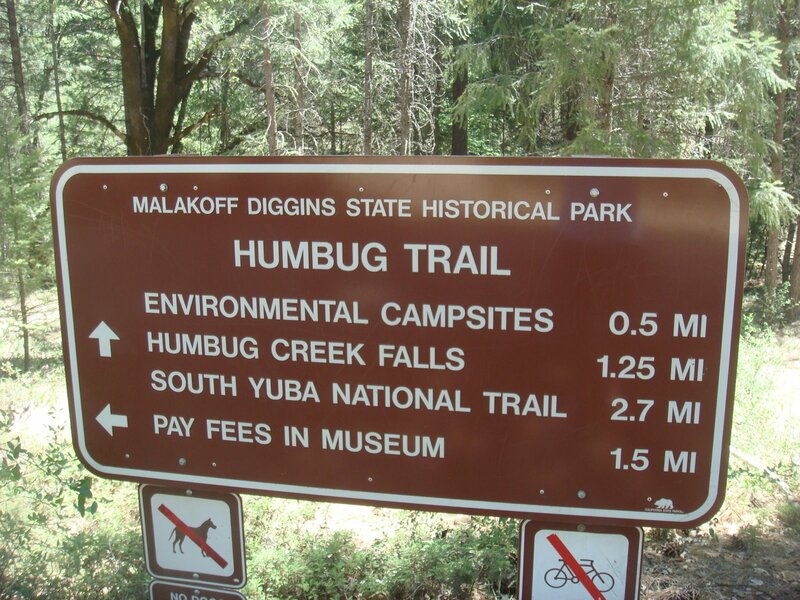 Tags: California, Humbug Trail, Justin Ames, Malakoff Diggins State Park. Bookmark the permalink. 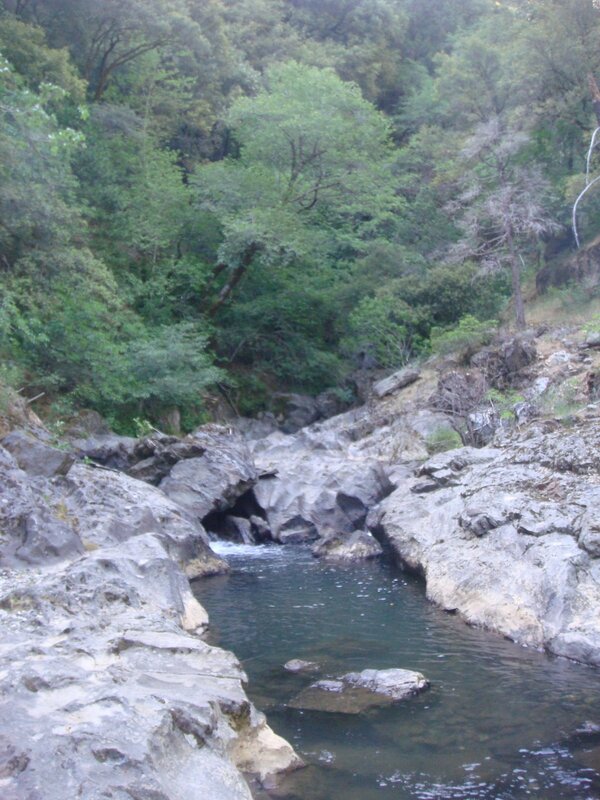 Is there some good rock jumping at this location? 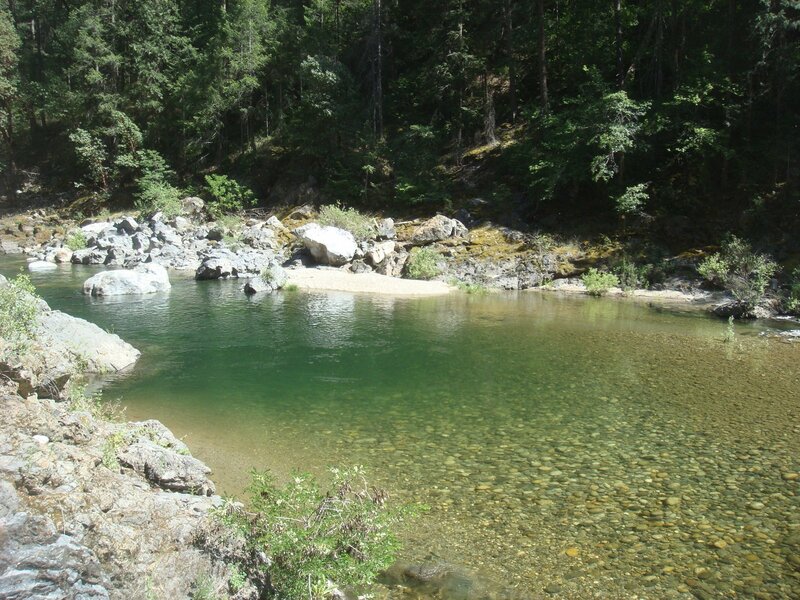 How would you rate the swimming hole? 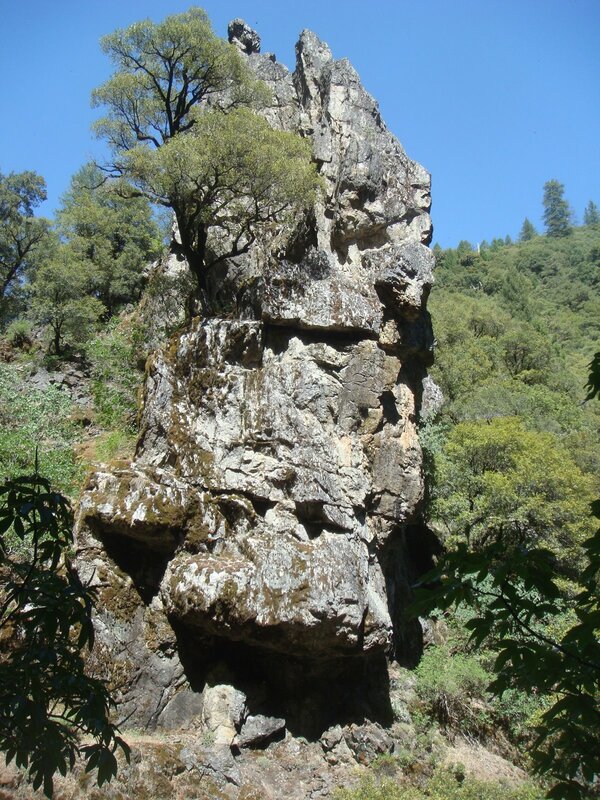 Hi Kevin – Thanks for your comments… In terms of rocks to jump off of, I didn’t see much. 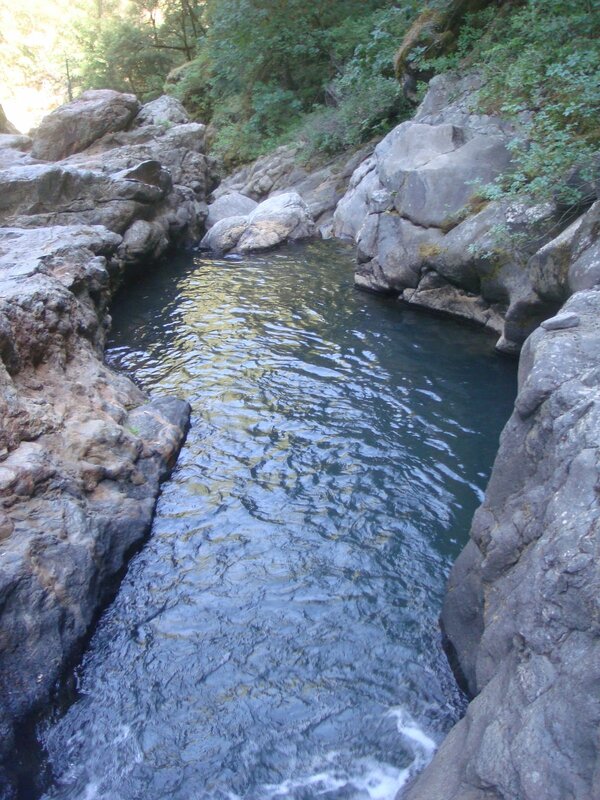 However, the swimming hole is top notch. 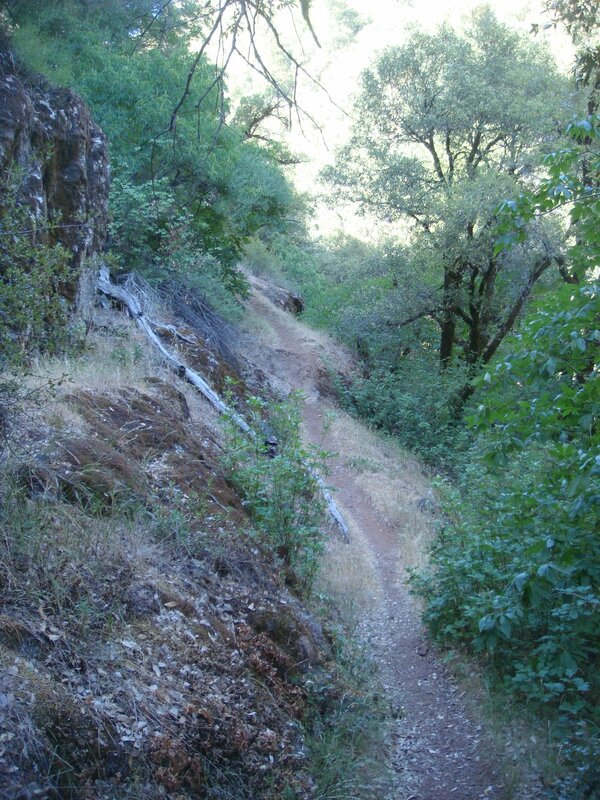 When you get to the bottom of Humbug Trail, you run into another trail that tracks along the Yuba River. 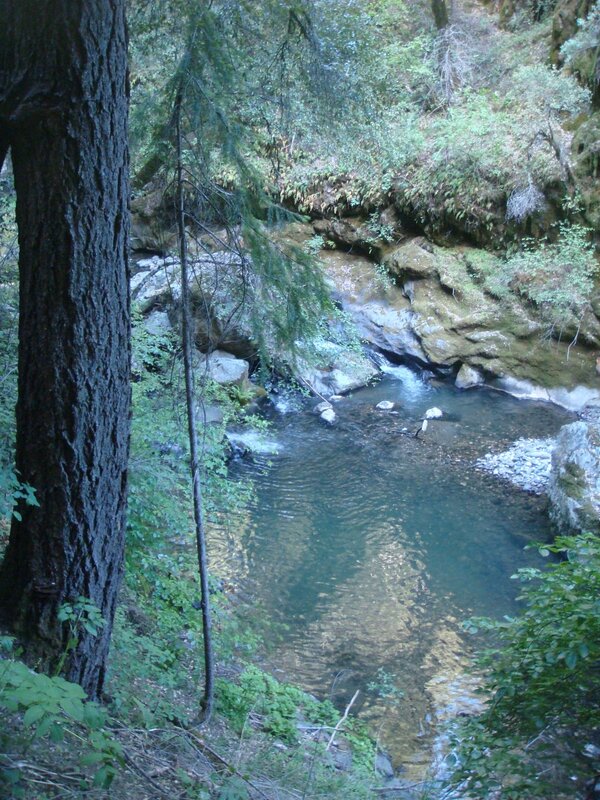 If you were to follow this up or down river, I’m sure you’d run across some other good swimming holes and likely some good jumping rocks.